Monarch Air Group provides private air charter in Opa-Locka, FL. Our clients benefit from top-notch service, unrelenting dedication to safety, wide selection of aircraft, and years of experience in chartering private jets. To obtain a free quote, please use our online quoting tool provided below, or call toll free 1-877-281-3051. Monarch Air Group offers private jet charter flights in and out of Opa-Locka, Florida. Opa-Locka is the city situated in the Miami-Dade County. The name Opa-Locka derives from “Opa tisha woka locka”, a Seminole Indian name meaning “the highland north of the small river on which located an old camping place.” Opa-Locka was incorporated by aviation pioneer Glenn Curtiss in 1926 as an “Arabian Fantasy” based on “The Thousand and One Nights” theme. Hence a number of streets in Opa-Locka have names like Sultan Avenue, Sabur Lane, Sesame Street, and Ali Baba Avenue. 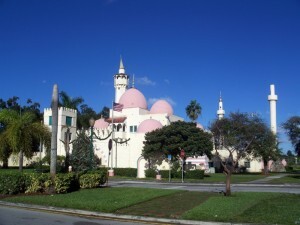 Nowadays Opa-Locka is a home to America’ biggest collection of Moorish Revival architecture and twenty buildings, which are in the list of the National Register of Historic Places.